Journal of the European Association for Health Information and Libraries Vol. 15 No. 1 Mar 2019 is published. You can read either the full issue or the individual articles and other items online. There are two Feature Articles: DocToBib: an expanding project of video research training tutorials for interns, health students and practicians, three years later & Hunting for the library value: benchmarking as a communication tool. Have a look at the book review about Competition policy in healthcare. Frontiers in insurance-based and taxation-funded systems. 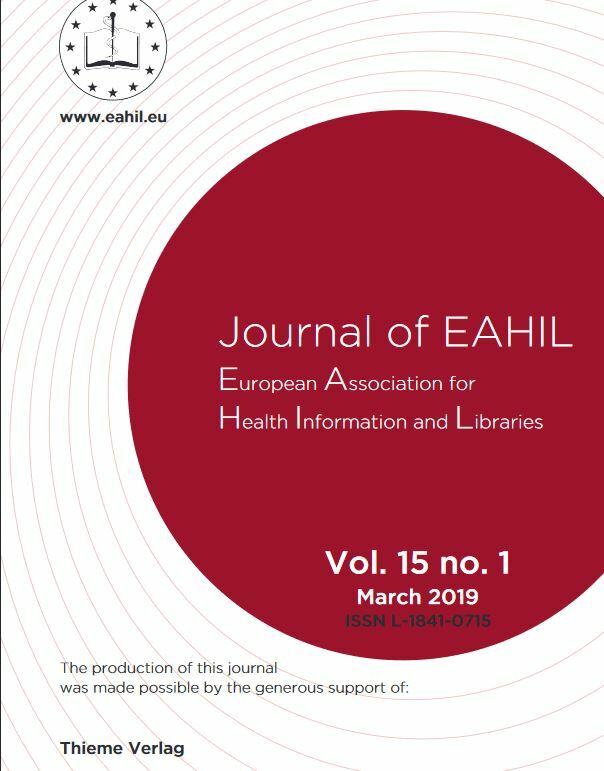 Read the regular items: Letter from the President, Report from the Special Interest Group on MeSH and National Library of Medicine Report for EAHIL. Do not skip the Letter from the Editor in Chief with exciting news plus the themes and deadlines of the next three issues of JEAHIL. Don’t Embracing failure and Art, medicine and libraries sound like really interesting themes?